​The most famous Serbian in the world is Nicola Tesla. Serbian people are very proud of him and consider themselves successors of his work. 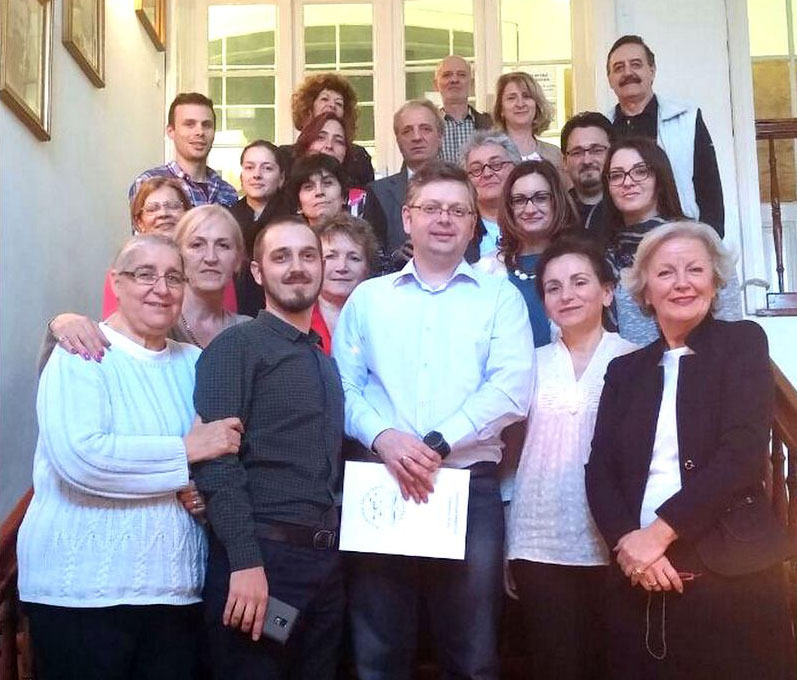 In particular, the International Association for the Promotion and Development of Quantum medicine “Quanttes”, which invited Dr. Oleg Sorokin to give a seminar in Belgrade, makes a lot of efforts to promote methods of quantum physiotherapy in Serbia. This has a lot in common with what Tesla was doing. ​Not many people know that among his multiple interests there was also medicine. In particular, he was interested in the possibilities of using electricity for physiotherapy. ​“I did experiments on myself, receiving high-voltage current of 2 000 000 volt with oscillation frequency of 300 000 or 400 000 times per second. This is just the process of pumping in and out the electricity from the human body, passing with a huge speed. (Note. Power of current was very small, otherwise he would have died. Deathful for a human is a current of 0.1 A and higher). Not being a doctor myself, I am not ready to say which diseases are treated with such a powerful method of electrotherapy. Let’s leave this to the representatives of medical profession”. “All Materia is governed by the same laws, the whole Universe is alive”. “Even the materia which is called non-organic and considered dead, replies to irritations and proves a doubtless presence of living principle in it”. “What makes the non-organic materia to transform into organic forms? It is heat and light of the Sun. Everywhere where there is heat and light of the Sun, there is life. Only in the boundless spaces of interstellar space, in eternal darkness and cold, life processes are temporally stopped, and, maybe, at the temperature of absolute zero, all materia may die”. ​Tesla’s most important discovery is ionosphere. Rather, he was the first, who realized that the planet earth is a gigantic electrical condenser, and the term “ionosphere” was introduced later by other scientists. Tesla understood that the Solar radiation, reaching the upper atmosphere, ionizes it, while lower atmosphere is a gigantic isolator. (Difference of potentials between the earth and upper atmosphere is 300-500 thousand volt, and the current power on the planet’s poles during magnetic storms on the Sun may reach 500 000 A). Therefore, we live inside a huge ball-like condenser. Tesla’s great idea is related to this discovery: he wanted to teach the humanity to scoop electricity directly from the air. For this purpose, he planned to build special towers – Tesla towers. This idea was not implemented, but scientists’ minds are still thrilled about it. By the way, lightning and polar lights are results of ionization of the upper atmosphere. But today we will talk about something different – how the Earth’s ionosphere influences our health, how we can use this knowledge for physiotherapy and how VedaPulse™ can help in this regard. For this reason, we need to know a little bit about the discovery of another scientist whose name is surrounded with no less secrets than Nicola Tesla’s. This is a German scientist Winfried Otto Schumann. 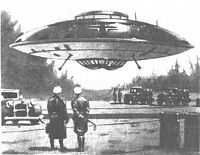 They say that he participated in a secret work on developing flying saucers of the Third Reich during the Second World War. Of course, this sounds fake. But we should note the fact, that all available biographies don’t talk about what he was doing during the war. They just say that in 1924 he became a Professor in Munich Technical University, worked in an electrophysics lab, which later transformed into University of Electrophysics. Basically, he has been working in the same place starting from 1924 and until his retirement in 1961. After his retirement he kept teaching there for two more years. Therefore, we can neither approve nor disapprove the information about the flying saucers. We mention it here as an example of the myths that surround lives of talented scientists. ​In any case, for us another fact is more important – the fact that is known for sure. In 1952 Otto Schumann, being a Professor in the Munich Technical University, made an assumption that there is a resonance of electromagnetic waves around the Earth. This resonance was later called after him. Two huge spheres, placed one in another – Earth and ionosphere – form a spherical resonator. It acts like a bell or a Tibetan singing bowl. In order for the bell to make sound, we need an impulse from its tongue, for the Tibetan singing bowl, we would use a wooden stick; in this case the impulse to electromagnetic waves is done by lightning strikes in atmosphere. If, after going around the globe, the electromagnetic wave aligns with its own phase – “bites itself by the tail” – then it enters into resonance and a so-called standing wave is created. Standing wave can exist for a long time even without an additional energy charge. The length of this wave is equal to the length of the circuit of the globe – 38 000 km, its frequency is 7,83 Hz. Besides the main frequency, due to multiple reflections between the earth surface and ionosphere, additional harmonics are created. By the way, the presence of harmonics in the sound of musical bells provides a sound rich in overtones, which is so pleasant. Here we are coming to the most interesting part. If we compare the electromagnetic waves of ionosphere and the waves, created by the human brain (EEG), it will appear that the main peak of the Schumann resonance frequency lies on the border between alfa- and theta-rhythms. Probably, you will ask how does it relate to the heart rhythm? We will answer this in details below. We suggest paying attention to the connection of electromagnetic fields of ionosphere and a human. 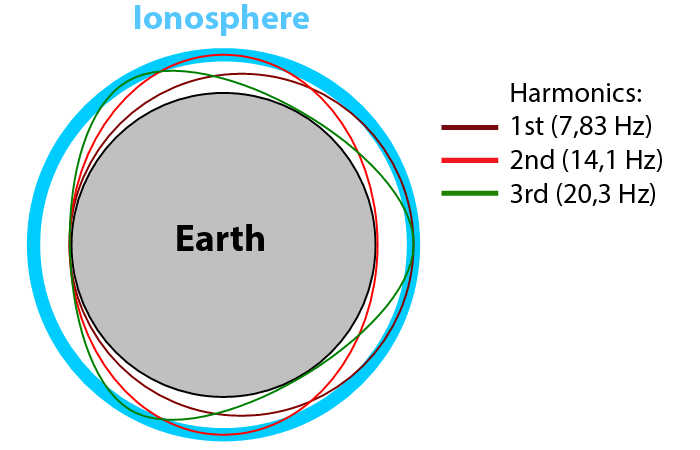 The main electromagnetic frequency of the Earth’s ionosphere has calming influence on a human. Speaking in the scientific language, it is called the phenomenon of absorption of the stimulation rhythm. 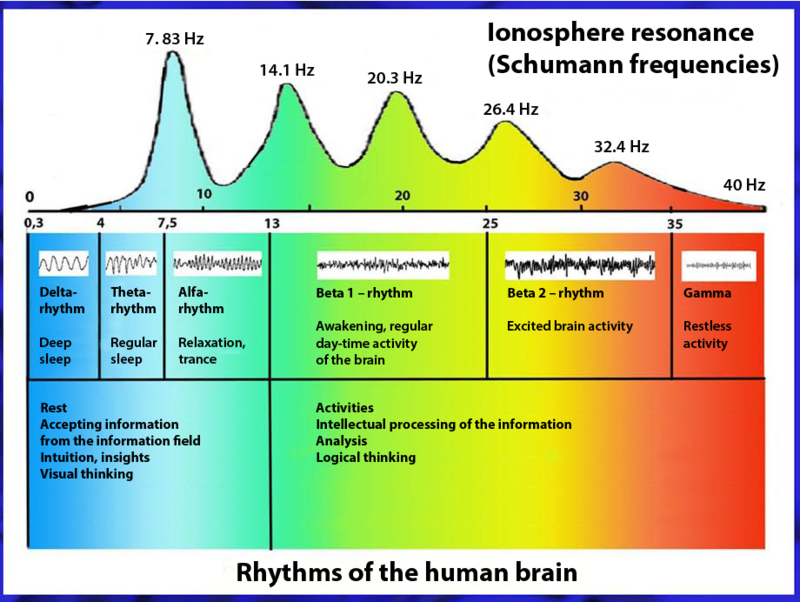 The brain “listens” to the electromagnetic music of ionosphere, adjusts to it and starts “dancing” in this rhythm. In fact, it is not just repeating the rhythm of external stimulation, but a complex individual response of the body. The electromagnetic “dance”, with which the brain replies to the external tune, has a more complex nature and sounds more like an orchestra where some music scores are performed by nervous “ensembles”. Anyway, such comparison was made by one of the pioneers of the EEG method, a Soviet researcher of the brain biorhythms, Mikhail N. Livanov, who was also a good pianist. He even created a whole diagnostic system based on interpretation of the brain’s biorhythm and evaluation of “the sound of electromagnetic music of the brain” in the context of whether it is harmonic or not. Sorry for this excursus – let’s go back to the topic about the relationship between electromagnetic background of the Earth and the human brain. So, while the main frequency of the Schumann resonance has a relaxing influence on the human, the secondary harmonics of the main Schumann wave fall on different parts of beta-rhythm, therefore stimulating the person for various activities. Considering that the main Schumann wave and harmonics are a bit flexible, in particular, electromagnetic background of day and night differ greatly, we receive a very complex relationship between the planet and the human. By the way, even the movement of trees in the forest and movement of any objects, especially hairy cats when they jump on our lap, changes electromagnetic fields locally around us. When we dance, the rhythm of our dancing also brings in the electrostatic whirl into the oscillations of electromagnetic field around us. To understand how these scientific discoveries are connected with VedaPulse™ and quantum physiotherapy, it is necessary to understand a core statement. Main source of life is energy, which we receive from the Sun. In this regard, research of the Soviet biophysicist Alexander Chizhevsky is very interesting. He devoted a lot of efforts to studying the influence of the magnetic storms on a human. Chizhevsky has determined that during a period of high solar activity (a lot of spots on the Sun), the Earth suffers from wars, revolutions, disasters, catastrophes, epidemics, intensity of the bacteria escalates («Les Epidemies et les perturbations electro-magnetiques du milieu exterieur», Paris, 1938). So, the instability of the solar energy flow leads to serious cataclysms. Do we know any Ayurvedic term that describes the balance of pranic energy received from the Sun in a human body? That is right, it is Three Doshas – Vata, Pitta and Kapha. We finally arrived at the most important part. Hopefully, all readers remember that we can evaluate the constitution type – balance of the three Doshas by the heart rhythm. The algorithm of assessing the constitution in the VedaPulse™ device is its most important function – it was created for this purpose. The influence of Doshas also manifests in the electrical activity of the brain. Moreover, if the heart rhythm mainly reflects the physiological component of the Dosha, electrical activity of the brain, first of all reflects the psychic component of the Dosha. Of course, it is more labile. We would like to pay special attention to the fact that both HRV and EEG are completely different things from the perspective of physics. EEG represents electromagnetic oscillations that accompany the activity of the brain cortex, HRV is a method of assessing the heart activity. But it is better to mention that heart contractions start by the command of electrical impulses. Basically, electricity lies in the basis of both of these events. And, of course, when we talked about the brain response to the external source of electromagnetic oscillations, we meant that it is not the brain itself that responds – it just reflects the complex reaction of the body. Spectral changes of the heart rhythm and changes of electrical activity of the brain – both are reflections of a COMPLEX reaction of the body. If the body reacts to electromagnetic waves of ionosphere, it will also reply in the same way to the influence of physiotherapy device. There is a very important nuance here. Academic approach to explaining the mechanism of therapeutic influence of electromagnetic field only talks about increasing the blood circulation. While performing a physiotherapy procedure, a specialist locally influences the sore area, increasing the blood flow to this place, which speeds up biochemical processes. That is why this method of therapy is usually used as stimulating, anti-inflammatory, antiedematous, sedative, analgesic measure. There is another approach, taken from the Chinese acupuncture, when we choose additional zones for the therapy, not the sore areas directly, but separate reflexogenic zones. The problem is that, usually, the selection of such zones is done on the basis of an oversimplified concept of the Chinese acupuncture. While a “real” acupuncturist takes into account the evaluation of TCM syndromes, which use a completely different logic than the Western approach of assessing symptoms, a physiotherapist using any device – generator of low frequency magnetic field – uses the logic of Western medicine for disease classification. Our company has created software solutions for EHF (frequency) therapy and quantum therapy, which combine all three schools at a time – Ayurveda (Doshic balance evaluation), TCM (meridians evaluation) and nosologic approach of Western medicine (ICD-10). 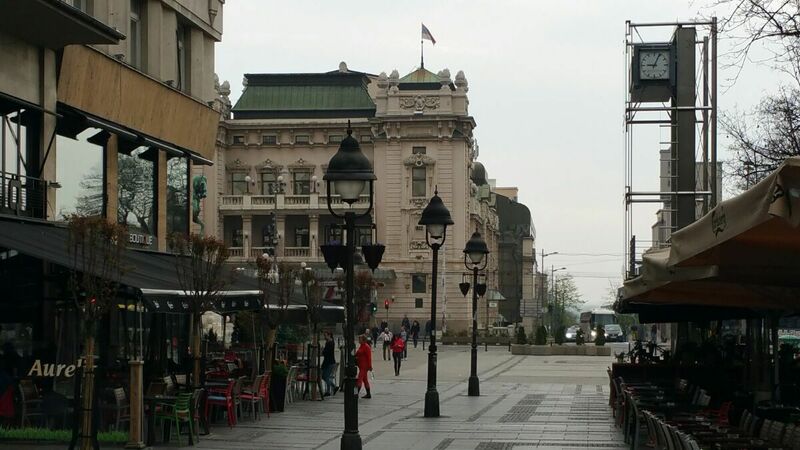 This was a true discovery for the physiotherapy specialists from Belgrade, where the seminar was held. The truth is that, as a rule, in the Western medicine “personalized approach” means genetic tests and detection of markers of predisposition to diseases, allergic reactions and so on. Our meaning of “personalized approach” is different. First of all, by this meaning we understand individual constitution type, which determines the peculiarities of the work of physiological functions regulation systems. Systematic approach means evaluation of energetic imbalance, and the aim of recreational therapy is to return the lost harmony during the disease, to create the conditions, which will aid the body to trigger self-recovery mechanisms. Today we followed the path of a human thought – how ideas of Nicola Tesla found their reflection in the minds of other scientists, how we came up with the understanding of healing power of electromagnetic field by researching the ionosphere of the Earth. Our contribution is in connecting the modern systematic approaches with the methods of Eastern medicine. Our mission is to carry the knowledge about our vision of the systematic approach. Every single seminar by Dr. Soroking is devoted to the fundamentals of the systematic approach to health. Such seminars are organized throughout the world. Before Serbia, such seminar was held in the UAE, the next one is going to be in the USA. We are open to cooperation with people, who share the same ideas, philosophy and approaches to health recovery. 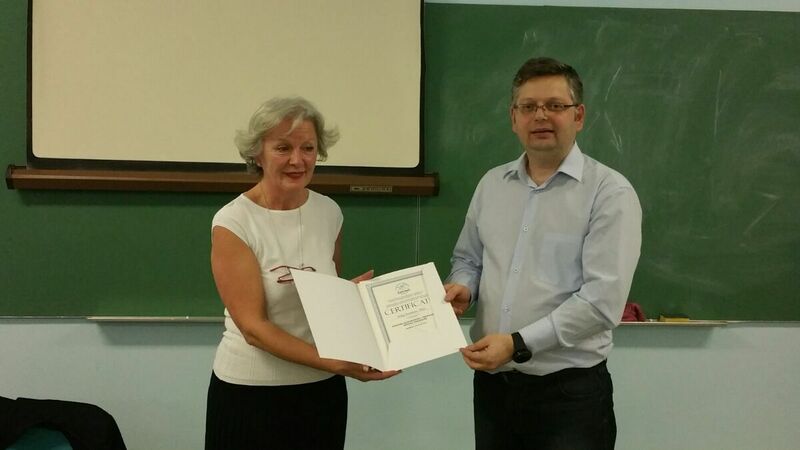 “Dear Oleg, during your visit and lectures some miraculous thing happened, which pushed me to the need for the new knowledge! Without any attempt to flatter, I'm trying to tell about this beautiful feeling inside my heart, when I met these endless opportunities! You’ve managed to transfer a part of your wisdom, excitement and inner calmness to me. Not only to me! 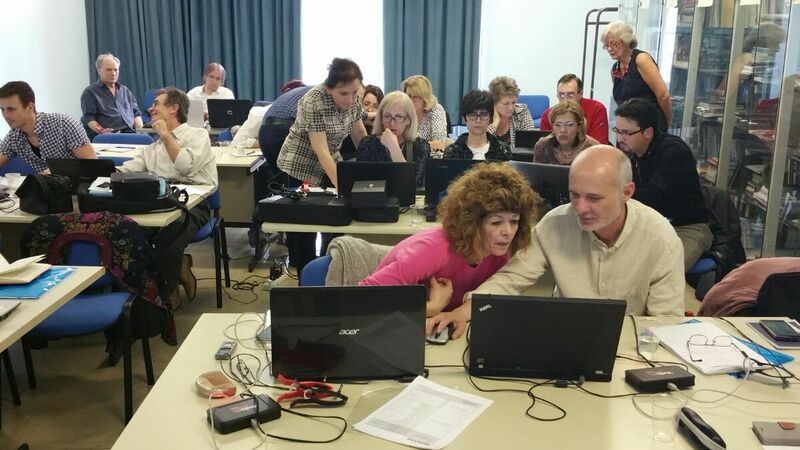 The participants keep calling me and tell me that they haven’ felt anything like this for a long time, charmed by the information, which you nobly shared with us, and offer new projects”. 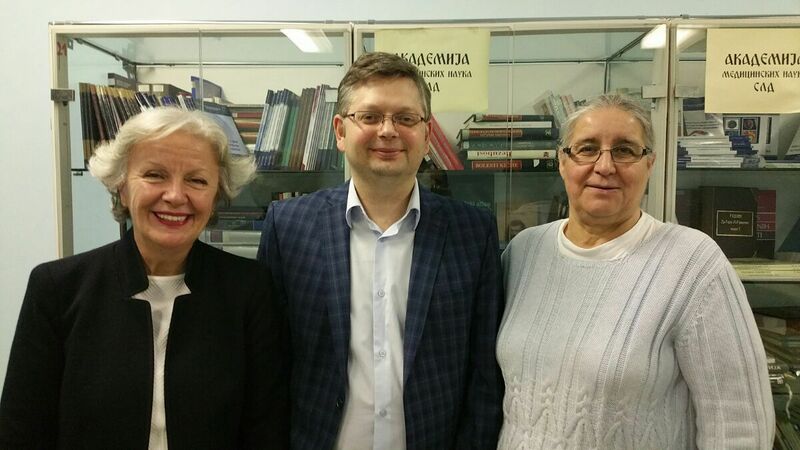 “For me, the seminar by Professor Sorokin was introduction of the new tendencies in traditional and modern medicine. His great knowledge is a result of integration of the skill and wisdom, which he received from the greatest of teachers of traditional medicine and giants of the modern Russian science. “VedaPulse” is a unique hardware and software complex and a modern device, which is able to help each therapist in any kind of medicine. It is an outstanding characteristic, when someone has such knowledge and unconditional love and ability to give it to the students by simplest ways, a gift given only to those, who have crystal heart and mind. Professor Sorokin opened many secrets for us, which give us confidence in determining early signs of functional disorders before the disease actually takes over. This is extremely important for preventive measures and individual approach to every patient. We get the opportunity to share happiness and prosperity with those in need of help”. “Dear Dr. Sorokin, your arrival lighted us up. We are very thankful to you for the lectures on the seminar, for our communication, for high professional skill. Your knowledge and high academic level of your lectures elated us. This is a true fortune that we cooperate with you. Hope for long and mutually fruitful partnership”.